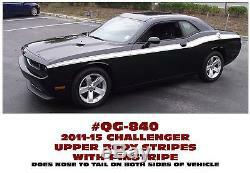 2011-15 DODGE CHALLENGER - UPPER BODY SIDE STRIPE KIT with PINSTRIPES. Installs on Fender, Doors and Quarter Panels from front to back. Does both sides of the vehicle. Part # QG-DC-11-840- CHOOSE A COLOR: Matt Black (Flat) #22, Black Gloss #12, White #10, Silver Metallic #120 or Red #53. Thank you for considering Graphic Express Stripes and Decals. Graphic Express manufactures automotive stripes and decals for Ford Motor Company. And Mopar, Dodge, Plymouth vehicles. The item "QG-840 2011-15 DODGE CHALLENGER UPPER BODY SIDE STRIPE WITH PINSTRIPE" is in sale since Wednesday, March 25, 2015. This item is in the category "eBay Motors\Parts & Accessories\Car & Truck Parts\Decals/Emblems/License Frames\Decals & Stickers\Graphics Decals". The seller is "graphic-express" and is located in Inverness, Florida.